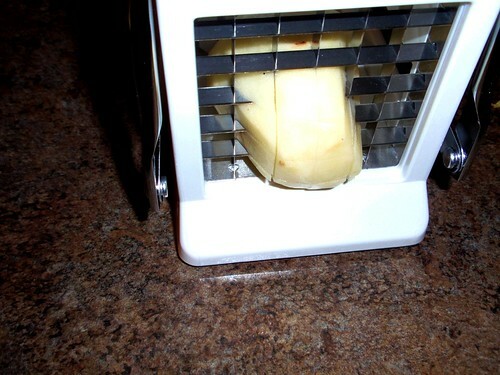 I received a potato cutter for Christmas, and let me tell you, it is awesome! And pull down on the handle. 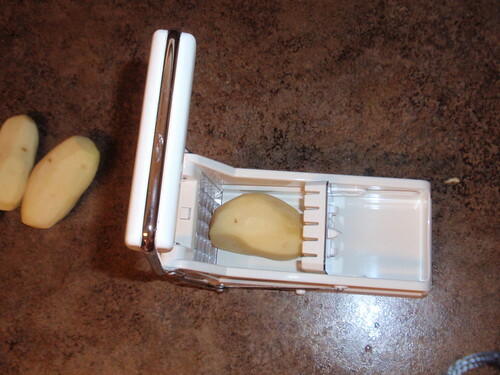 The cutter pushes the potato through the grate and cuts the potato into perfect rectangles. 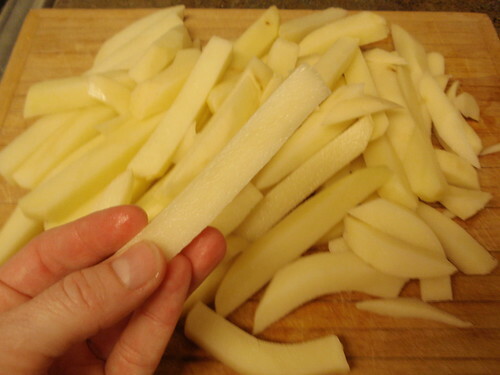 They are great for french fries or for using in potatoes au gratin. 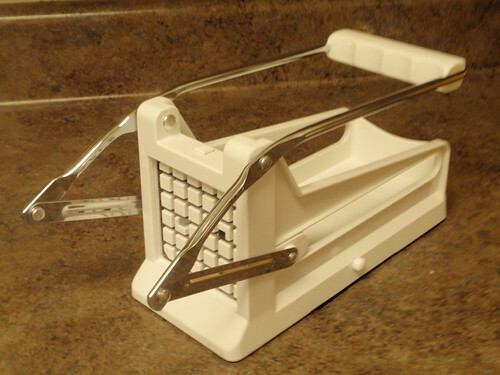 The potato cutter is not a necessity in the kitchen, but it is a pretty cool accessory. 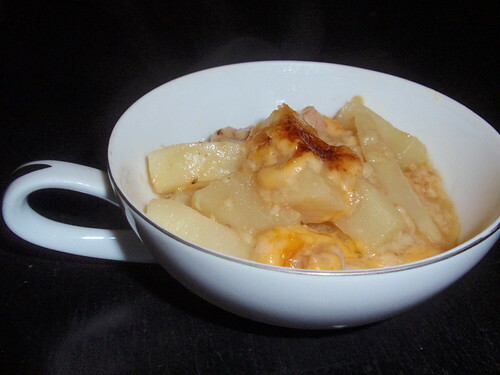 Whether you have a potato cutter or not, this potato au gratin dish is delicious. Any time you combine potatoes with creamy cheese, you're bound to have a great dish. This version is lighter than most. That by no means makes this a "diet" food, but it does cut out some of the unnecessary calories. Melt butter in a Dutch oven over medium-high heat. Add onion and garlic; sauté 5 minutes or until onion is tender. Combine milk, salt, pepper, and flour, stirring with a whisk. Add milk mixture to pan. Bring to a simmer; cook until slightly thick (about 2 minutes), stirring frequently. Add 4 ounces cheese and ham, stirring until cheese melts. 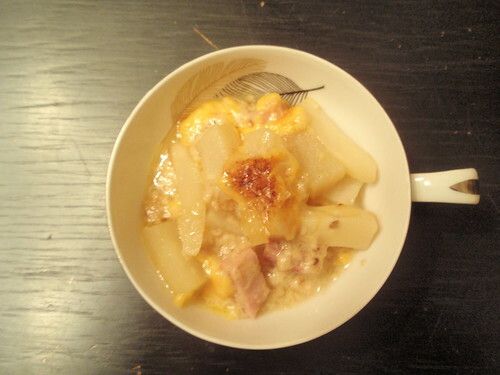 Stir in potatoes. Place the potato mixture in a 13 x 9-inch baking dish coated with cooking spray. Sprinkle potato mixture with remaining 2 ounces of cheese. Cover with foil coated with cooking spray. Bake at 350° for 45 minutes. Uncover and bake an additional 30 minutes or until lightly browned and potatoes are tender. Let stand 15 minutes before serving. It may be premature to say that spring has sprung in Tuscaloosa, but the weather has been so wonderful! The trees are starting to bud, and the temperatures are hovering in the mid 70's. Warmer temperatures mean it's time to start using the grill, again! This grilled chicken recipe is a staple at our house. Marinade chicken in Italian dressing and Dale's for at least 30 minutes or up to 3 hours. 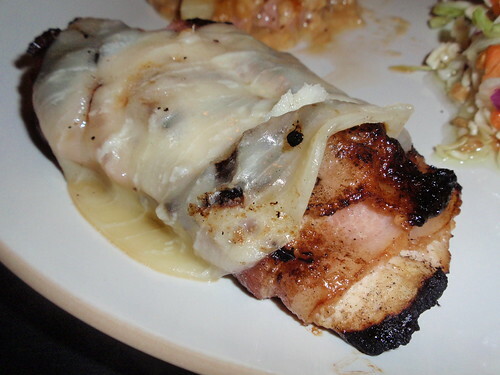 Wrap each chicken breast with a slice of bacon, securing with a toothpick. If using a gas grill, turn burners to high and close the lid to let the grill get really hot. This is crucial. Once your grill is nice and hot, oil the hot grate with a wad of paper towels. Using tongs, arrange the chicken on the grate. Close the lid. Grill for 5-7 minutes, then flip the chicken breasts. Close the grill cover again and cook for another 5-7 minutes. The best way to test is to remove one breast from the grill and slice into the thickest part from the top. You are looking for no pinkness in the meat. Remember that the breasts will continue to cook a little after you've removed them from the grill. 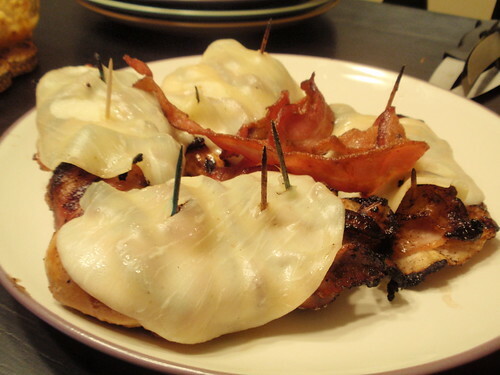 Place a slice of provolone on top of each chicken breast. Let the chicken breasts "rest" for about five minutes before serving them whole. *Don't forget to remove the toothpicks or at least warn your guests before they cut into the chicken. Eggplant Parmigiana and a Bambino? 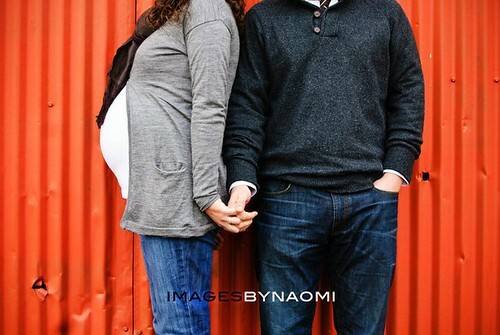 Today, February 22 is Kathleen's due date! 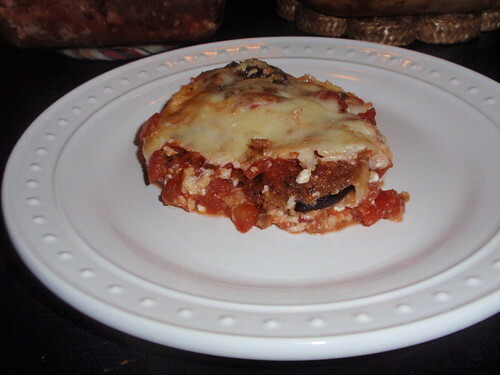 We can't wait for Kara to arrive, and to help speed up the process, we thought we'd offer some encouragement with Scalini's Eggplant Parmigiana. Scalini's is an Italian restaurant located in Smyrna, Georgia. According to legend, the plate of breaded eggplant smothered in marinara sauce and cheese is claimed to induce labor within 48 hours. The restaurant even has a Baby Wall displaying the names and photos of the babies born after their mothers enjoyed the Eggplant Parmigiana. Maybe we'll be able to add Kara to the wall. Valentine's Day is my least favorite holiday. I think it is over-done and excessive. This year, JB and I decided to stay in and skip the extravagant dinner. Maybe it's a sign that we're getting old, but the thought of getting all dressed up to wait an hour or more for a mediocre dinner was not very appealing. 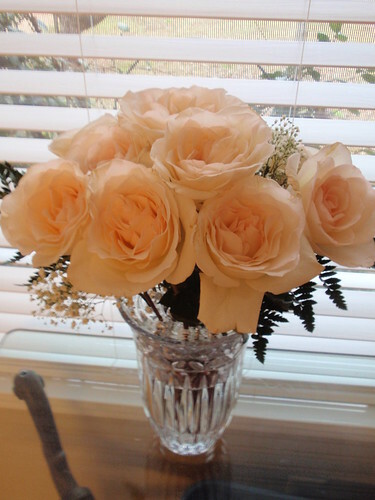 However, it is nice to get flowers no matter what day it is. I picked shrimp and grits for the menu because it's one of his favorites. Shrimp and grits may seem like an odd combination to some, but trust me, it's delicious. 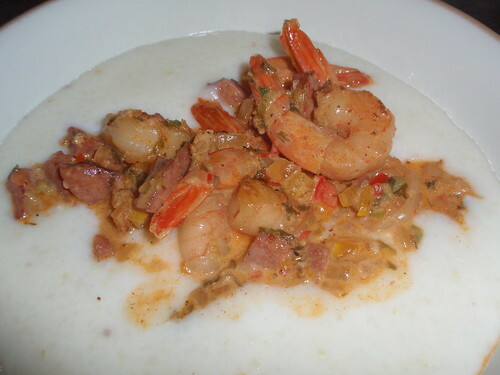 This recipe is a classic Charleston-style shrimp and grits. You can control the spice by using more or less of the Essence seasoning. I used about half of the Essence seasoning for the shrimp, and then I omitted the second addition (see recipe below.) I also recommend starting on the grits first. Season the shrimp with Essence and salt. Heat a large, heavy saute pan over medium-high heat and sear the andouille, cooking for about 3 minutes. Remove the andouille to a plate, and add the shrimp to the pan, and cook for 2 to 3 minutes. Remove the shrimp from the pan, and heat the oil. Add the onion and bell peppers and cook until soft, 3 minutes. Add 2 tablespoons Essence to the pan, stirring well, then add the garlic and cook 1 minute. Add the chicken broth to the pan and cook until reduced slightly, 5 minutes. Stir the cream, green onions and parsley into the sauce and return the andouille and shrimp to the pan. Return sauce to a simmer and continue to cook until reduced slightly. Stir well and season to taste with salt and pepper. Serve over Charleston-Style grits. In a large, heavy sauce pan bring the water to a boil. Add a generous teaspoon of salt and the grits and stir with a wooden spoon to combine. When grits thicken add milk, cream and butter and return to a boil. Reduce heat to a simmer, cover sauce pan and cook for 45 minutes to one hour, until grits are tender, smooth and creamy. Taste and season with salt and pepper. Keep covered and warm until ready to serve. Source: New New Orleans Cooking by Emeril Lagasse and Jessie Tirsch. Published by William and Morrow, 1993. Preheat the oven to 350. Spray a 9 x 13 pan with nonstick spray or grease 15 cupcake holders. In a large mixing bowl, mix together the sugar, flour, salt, baking powder, baking soda. Then add the mashed banana, buttermilk, eggs, oil, and vanilla. Spread batter into the prepared pan. 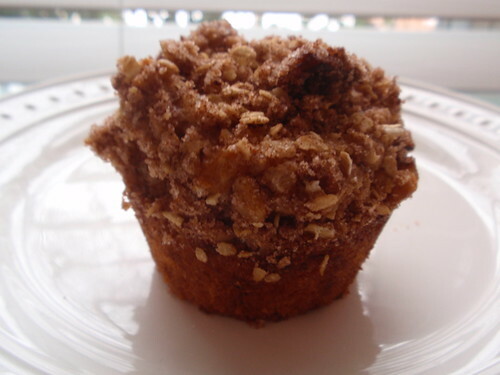 Make topping: Mix together the 1/3 cup sugar, flour, cinnamon, nuts, oatmeal. Then mix in the melted butter. Sprinkle topping over the batter in the pan. Place pan in the 350 oven and bake for 40 minutes. 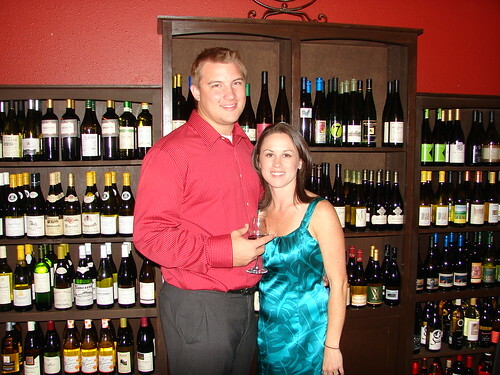 Today, February 18, is National Drink Wine Day - as if I needed a reason. So have a glass...or two and think of me! Vampire Weekend is one of my favorite bands, and I love their song Horchata. It's a catchy tune that I instantly liked. 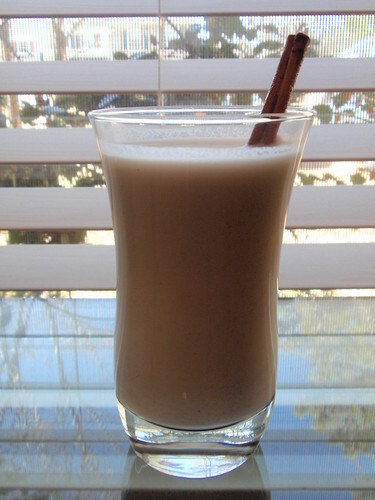 I'd never heard of horchata, so I googled it and learned that it is a Spanish beverage made from ground almonds and/or rice. It sounded interesting, so I made a batch. It was definitely interesting, add a little bit of coconut rum, and it makes it enjoyable. I'd be interested in trying this from an authentic source. You can find the recipe I used from Rick Bayless here. I had never had German Chocolate Cake before today. It's never been a dessert that seemed particularly appealing to me. I've only recently started to try things with coconut. But a dear friend made a special request, so the search for the perfect recipe ensued. I feel very strongly about searching for the right recipe for each dessert I make. For instance, I think there are sure sources for a good quality dessert recipe. I wouldn't typically look through a Rachel Ray cookbook for a dessert recipe; I would consult Martha Stewart or Dorie Greenspan. I also wouldn't look for a marinade in my Paula Deen book; I would look to Bobby Flay. Besides, comparing recipes, their ingredients, the methods, and their reviews is all part of the fun of baking. I received The America's Test Kitchen Family Cookbook for Christmas. It is a wonderful cookbook for beginners or veterans. Their recipes are easy to follow with great illustrations, and so far, they have all turned out beautifully. 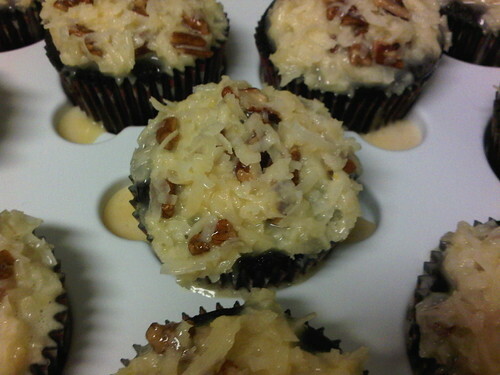 This is where I found the perfect recipe for my German Chocolate Cupcakes. Preheat the oven to 350 degrees. Line muffin tin with paper liners (or grease and flour bottom and sides of 3 8-inch round pans). Whisk flour, baking soda, baking powder, and salt in a large bowl and set aside. In a separate bowl, whisk boiling water, chocolate, and cocoa until smooth. Beat butter and sugar together until light and fluffy, 3-6 minutes. Beat in the eggs, one at a time, until incorporated, scraping the bowl and beaters as needed. Beat in sour cream and vanilla. On low, beat in 1/3 of the flour mixture. Beat in half of the chocolate mixture. Repeat wth half of the remaining flour mixture, then the remaining chocolate mixture, and finally the remaining flour mixture. Give the batter one final stir using a rubber spatula. Divide batter evenly among the prepared pans and smooht the tops. Bake 15-20 minutes. Let cakes cool in the pans for 10 minutes on a wire rack. Remove onto wire rack, and let cool completely before frosting, 1-2 hours.